Whether you are looking to introduce your new exciting product or you are looking to arrange funds for your company's brighter future, email marketing is one of the best ways available on Internet to spread what you have to say to all your potential customers. If you are a blogger/ online entrepreneur then there is lots of chance that you have heard the email marketing somewhere. But lots of people still don't know what it really means. So what exactly is Email Marketing? In simple words it's the new advance format of paper pamphlets. You write a article introducing your new product or telling people why they should buy it and then send it to your potential customers via Electronic Mail or Email. Why people like Email Marketing more than TV marketing? Email Marketing vs. TV marketing is a debate that has made their way in normal entrepreneurial life in recent years. And a lot of people are choosing Email marketing over TV ads. Why? Because you can target more specific customers with a lot less money. Also You do not need to pay an advertising company lots of money just to get your ad created. You can hire a writer from Internet in $10 and he will do the job. Hundreds of available free templates are the power of Benchmark Email. They have a very helpful live customer support and Google Analytics tracking. They also have a free plan if you are looking to get started then this is one of best platforms to do so. However it comes with its fair share of problems. It has No Gmail or other third-party contact integration. also does not support mobile preview. The Email editor wae also not working properly while tested. They have an awesome autoresponder functionality. Also we liked their responsive email designs. Other features include split testing in-depth reporting, RSS / blog to-email functionality, comprehensive segmentation options and more. They have 3 main plans which is supported with many other ad on plans which is quite confusing for new uses. Also many features are restricted and you only get unlimited access to them if you buy a higher plan. With Mailgen you can not only create marketing emails but also you can create forms and surveys to know customers feedback. They offer more than 130 email templates and all of them are customizable plus you can design your own template if you like. However you can not preview your email before sending it which can be a nightmare if you often make mistakes while typing. One more feature it lacks is the ability to segment your campaigns by demographic. If you are a new at email marketing Campaigner is a great way to start it. There are hundreds of templates to play with. Also, it has a great tutorial section for beginners. They also give you a 30-day free trial so you can check out their service before buying. However, you still have to give your credit card details for a free trial. Some people also reported issues with Gmail Import feature and with their live customer support. It comes with a free two weeks trial where you can try lots of it's features. Also,if you are looking to create a very professional email campaign then their integration of social networking and email marketing is very helpful in that. Their dashboard is not so clean and takes sometimes be understood completely. Available site tools also have a confusing UI which makes it hard to use. They provide timely, personalized, and targeted messages to your customers which are very helpful if you have the big fan base and lots of people sign up for your list every day. With this you can send a welcome email to every new customer and then send them email based on schedule so you don't spam their inbox but keep your company remembered too. However, they have limited data importing capabilities so you might face some problem with it. You can create the campaign using creation wizard, HTML code or plain text as you like. They also have a Generous free plan and great customer support which is a very big plus point in this market. like others they also come with some problems. People have reported that their site Glitches with uploading contact. Also, they faced problem while receiving notifications. Active Campaign is Email Marketing service created for small and medium publishers. Active campaign stands out in this list for its impressive automation features. You can use tags etc to manage all your mailing campaigns. There aren't any specialised complains of the company but we still don't know their capacity for managing bigger email campaigns. Unlike other companies listed here Convertkit is a relatively jew but fast-growing email marketing company. 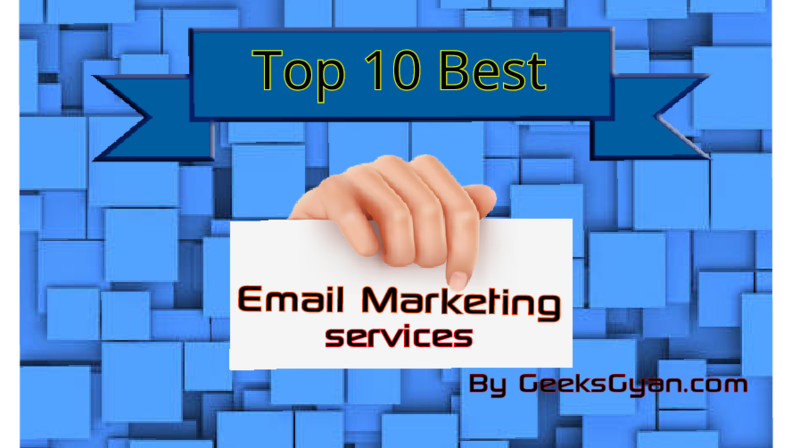 And seeing their track record I think they definitely deserve to be on the list of top ten email marketing tools. With them, you can build multiple forms with various opt-in incentives. You can also display custom massage to subscribers who are already on your list. They also got lots of Automation tools and other features that makes them worthy to be mentioned. And finally the best. At the end of the day its, the user experience that really counts and I have personally seen lots of big bloggers using MailChimp for managing their email subscribers list. Yes, they do have some problems but that is more based on who uses it so I don't think they really count. Their main features include their different marketing reports you can use through MailChimp. They also offer a free account for very small businesses and paid services also are also affordable. They have a built in template and editor to edit it according to your needs too. Have you used any of these Email marketers? If yes then do tell us your experience with them in the comment field. Also, if you have any questions then be sure to ask in the comments field. Agree mailchimp all the way, we use it for Local SEO and Advertising business and it has everything we need and more. We have a a large customer base of overworked busy small business owners and rarely, if ever has a client felt the need to migrate away from Mailchimp. It also works well alongside Mandrill if you need transactional email and if you are a Wordpress site owner you will have the pick of compatible plugins too.